Abbot Ailred of Rievaulx recorded of Alexander I that he was 'beyond measure terrible, a man of great heart, applying himself in all things beyond his strength.' Alexander or Alasdair mac Mael Choluim, was born around 1078, the fifth son of Malcolm Canmore and the Saxon St. Margaret, the daughter of the Saxon Edward Atheling, otherwise known as 'Edward the Exile'. He was named in honour of Pope Alexander II and his pious mother paid close attention to his education, particularly in matters of religion. 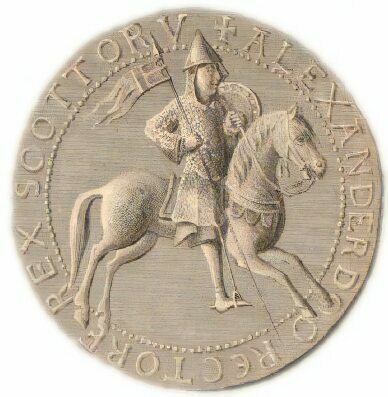 Alexander succeeded to the Scottish throne on the death of the childless King Edgar in 1107 and continued the Normanization of Scotland which had been begun by his elder brother. His younger brother David was granted, in accordance with Edgar's instructions, lands in Lothian along the Upper Tweed and Teviot. David did not receive the title of king, but was known as "prince of the Cumbrians", and his lands remained under the king's final authority. The Celtic lords of the north, displeased at the introduction of Norman habits and customs into Scotland, rose in rebellion in favour of one of the descendants of Lulach. The rebellion was put down with ferocity. In 1114 Alexander joined his brother-in-law, Henry I of England, on campaign in Wales against Gruffudd ap Cynan of Gwynedd. A further alliance with England was forged by the King's marriage to Sybilla, the illegitimate daughter of his brother-in-law, Henry I. The marriage failed to produce issue. Sybilla died at Eilean nam Ban (the Island of the Women) on Loch Tay in July 1122 and was buried at Dunfermline Abbey. Alexander did not remarry and was said to have planned an Augustinian Priory at the Eilean nam Ban dedicated to Sybilla's memory. Like all the sons of St. Margaret, Alexander was both devout and scholarly. He supported the Scottish church and resisted English attempts to place it under the authority of the Archbishopric of York. He brought Augustinian canons to Scone and after sheltering from a storm on the Isle of Inchcolm in the Firth of Forth, established an Augustinian friary there. King Alexander I died on 23rd April, 1124, at Stirling Castle and was buried at Dunfermline Abbey. He left no legitimate heirs and was succeeded by his brother, David I.